President Obama’s mind-boggling statement about Marxist Hugo Chavez of Venezuela not having “a serious national security impact” on the United States is getting little national media attention. But like the private conversation with outgoing Russian President Dmitry Medvedev in March, the comments about Chavez, who operates Venezuela as a satellite of Communist Cuba, are nothing less than a scandal. Obama told Medvedev that he would have more “flexibility” to make concessions to the Russians after he is re-elected. The comments were accidentally picked up by an open microphone. 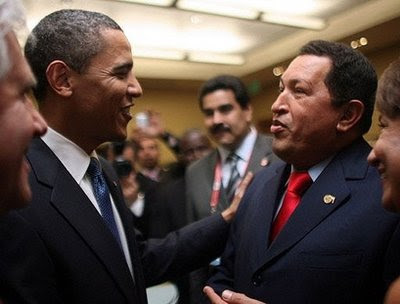 Obama’s remarks come just a few weeks after former CIA officer Brian Latell told the Heritage Foundation that the Venezuelan regime’s spy operations have become an “adjunct” of Castro’s intelligence service, the DGI. Latell also told Heritage, as he documents in his book, Castro’s Secrets, that Chavez was probably recruited by the DGI during trips he made to Cuba before seizing power in Venezuela. The Latell book discloses information from a DGI defector that Fidel Castro knew about JFK’s assassination in advance, adding to the widespread belief that Castro was behind the plot to kill Kennedy. He says the DGI has hundreds of agents in the U.S., some of them “moles” in the U.S. Government. One of the most notorious was Ana Belen Montes, the highest-ranking Cuban spy ever imprisoned in the U.S. She was a senior analyst at the Defense Intelligence Agency. Latell’s book also documents that Castro wanted the Soviets to launch a nuclear first strike on the United States, using the Soviet missiles which had been stationed — and then removed after Kennedy demanded it — in Cuba. Since Latell is a former National Intelligence Officer for Latin America and Director of the CIA’s Center for the Study of Intelligence, and Obama, as President, has access to CIA information, it would appear that Obama is deliberately ignoring the facts about the threat posed by Chavez and his allies, Cuba and Iran. The term “destabilizing activity” is apparently a euphemism for terrorism and relations with state sponsors of terrorism. Romney says Obama is “out of touch,” which is giving him the benefit of the doubt. Obama has access to the best foreign policy information available. If anyone should know about the Chavez threat, it is Obama. The “out of touch” comments come as Obama has left an American hostage, Alan Gross, imprisoned in Cuba for almost three years. But his administration granted a visa to Raul Castro’s daughter, who was recently allowed to visit the United States to campaign for gay rights and endorse Obama for president. “As a citizen of the world, I would like him [Obama] to win,” Mariela Castro Espin said in an interview with CNN during her U.S. tour. This sounds like the “flexibility” Obama promised to the Russians if he is elected to a second term. Can you image the media outrage if some foreign despot or crackpot had said nice things about Mitt Romney? Latell told the Heritage audience that Alan Gross was not a spy, although that is the charge the kangaroo courts in Cuba convicted him of. Gross, who has been called “Cuba’s Jewish American Hostage,” was part of a U.S. foreign aid program to help Jewish people in Cuba communicate using the Internet. State Department spokeswoman Victoria Nuland said on June 14 that Gross has lost more than 100 pounds since his arrest, suffers from severe degenerative arthritis, and is no longer able to walk in his cell. His 90-year-old mother in the U.S. has lung cancer and his daughter also has cancer. TV personality Haza asked Obama about Alan Gross but the president responded without saying anything specifically about the case or calling for his release. “That’s why I say that we’re not going to see big moves or major improvement in the U.S.-Cuba relationship if the Cuban leadership continues to do the same thing over and over again,” Obama replied. The Castro regime wants five Cuban spies, who are imprisoned or in custody in the U.S., freed in exchange for Gross, who is not a spy. Obama apparently does not want to make such a deal before the election in November.